On 4 June I participated with Patrik Jotun, (a researcher and analyst at the Ministry for Foreign Affairs), in a symposium organised by the Green Liberals with the theme, “Environmental and Climate Policy in the Shadow of Developments in Russia – on environment, climate, security and energy supply”. The delegates were allowed into the Folk Party’s premises at Mynttorget under strict security control. My presentation was somewhat similar to that I gave at The Economist’s recent symposium in Stockholm and so I will direct you to my earlier blog on that event for details (European Energy Horizons 2014). I found Patrik Jotun’s presentation very interesting and it gave me new perspective on the tensions that we see today between the EU and Russia. I will, therefore, focus on his presentation and add a few comments on it. From the fall of the Soviet Union until 1998 the Russian economy crashed and in 1998 their GDP was comparable in size to that of Sweden’s. However, with Putin at the helm the economy stabilised and up until 2008 it grew at the same rate as China’s. By then Russia’s GDP was similar in size to that of Italy. Considering the size of Russia’s population that is a very low GDP. The increase in GDP was directly coupled to the fact that from 1998 until 2008 the price of oil rose from $20 per barrel to the record level of $147 per barrel. It was during this time that the value of Russian investment funds increased enormously in Sweden. When the global economy crashed in 2008 and the price of oil sank to below $50 Russian economic growth halted but the investment funds in Russia that had been created during Russia’s happier economic days saved Russia. Now the price of oil has stabilised at around $100 per barrel and Russia’s GDP is back at Italy’s level but no growth is seen. This means that Russia’s GDP has difficulty to growth without a higher oil price. Of course, President Putin and his economists were aware of Russia’s dependence on exports of raw materials. Already in 2002-3 Putin noted that Russia needed to diversity its economy. Oil and natural gas must be the motor in the economy to generate the production that, in its turn, generates the possibility of increased consumption. Now in 2014 we can see that Russia has not succeeded in this diversification. One example is that they are exporting crude oil to other nations that then transform it into products that can be sold at a higher value. Sweden is one of the nations buying Russian oil and transforming it into products for export. In practice this means that our net payments for oil are reduced. The fact that Russian GDP is so strongly coupled to an increased oil price means that, with a flat oil price there is no economic growth in Russia. Russia inherited an aging military and when the economy grew in the mid-2000s Putin planned a new, gigantic military strategy that would transform Russia into a great power. The economic crisis of 2008-9 meant that it was difficult to carry out this ambitious program but Russia’s still relatively healthy state finances meant that there was nevertheless room for some investment in this direction. However, zero growth under an extended period has meant that Russia has arrived at a situation where the military investments must be wound back. Patrick Jotun judged that, in purely economic terms, Russia was in a very poor situation if energy prices continued at current levels. Russia might be able to continue in its current direction for another five years but then the cupboard will be bare. Apart from exports of energy raw materials they have little else to offer. 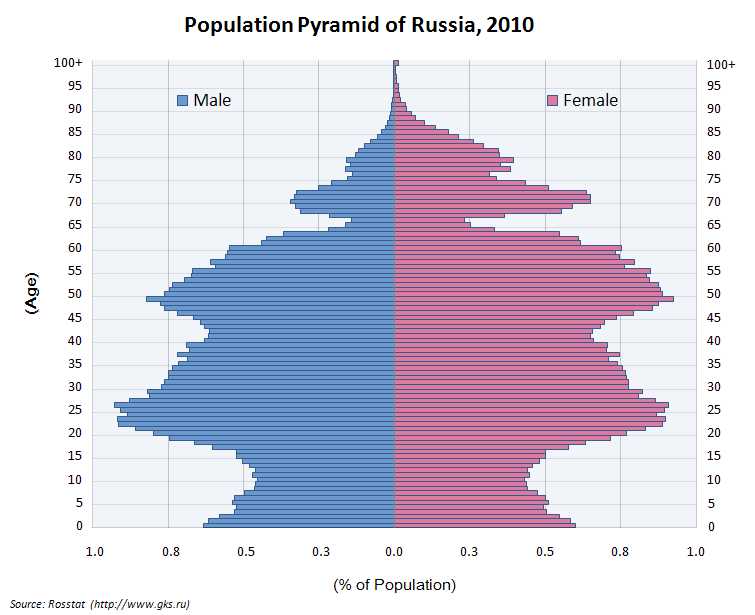 As the “icing on the cake” Patrik examined Russia’s demographic issue. The information above is from 2010. If you look at the number of women and men then you see that approximately the same number are born and up until the age of 35-40 there are fairly equal proportions of men and women. However, among those older than this there is a preponderance of women and this indicates that the health of men is relatively poorer. A large problem is named Vodka. Those that were 65-70 years old in 2010 were born during and after the second world war and we see that the number of children born in Russia at that time was very low. Then the number increased until the 1960s when it was time for that smaller war generation to have children. The number of children decreased and then later began to increase again. Then we see that there was a marked decline with the fall of the Soviet Union. Compared with the 1980s the rate of births almost halved and that means that Russia has half as many 15-year olds as 25-year olds. The young generation that grows up in Russia today will have a much larger burden to bear on its shoulders. The fact that the Russian army needs new, young soldiers (that, in practice, exist among the 15-year olds) means that the army must be completely restructured. Today’s 15-year olds will be needed in productive industries if Russia’s economy is to have the possibility of growth. At the moment Russia has an army with equipment dating from the 1980s. Putin has begun the work of modernizing the military but currently there is insufficient money to build a high-technology force and Russia lacks to technological competence to do so. The success they have had so far is with air defense. Russia’s approximately 25,000 tanks are now ~30 years old and the goal now is to produce ~2,500 new modern tanks by 2020, i.e. one tenth of the previous force. Export income from oil is completely decisive for this modernization. Patrik Jotun regarded Russian military capability as “a joke” compared to that of the USA and Nato. The next point was the EU’s dependence on Russia and Russia’s dependence on the EU. If we study export volumes from Russia to the EU they are 45% of all Russia’s exports. Well back in second place is China with 6.4% and Belarus is in thirst place with 3.9%. For imports to Russia the EU tops the list with 34.1% and China is in second place with 15.5%. A little surprisingly, Ukraine lies in third place with 5.5% and then the USA contributes 3.9% of imports. From the USA, Russia needs primarily equipment for the oil industry. If one looks at exports to Russia from the EU’s perspective, Russia receives only 10% of the EU’s exports since the EU has much greater trade flows than Russia. Finally Peter Jotun discussed environmental considerations in Russian energy companies and asserted that, while the Russian companies’ websites show consciousness of environmental issues, in reality there is nothing of this kind to note in their practice. He also discussed the new energy export agreement between Russia and China and mentioned that China had written in tougher environmental requirements into the agreement than the EU has required in its deals with Russia. 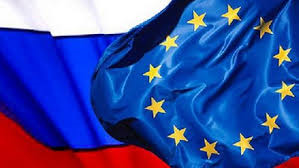 The agreement with China is important but will not immediately change the fact that Russia is more dependent on exports to the EU than the EU is on exports to Russia. Russia is still dependent on the cash flow that exports of oil and natural gas generate. In purely economic terms that may be correct but in terms of replacing Russian oil and gas in the EU’s energy system there is currently no alternative. Russia has displayed its old tanks at the border with Ukraine and of course that can look threatening. The fact that they are now withdrawing their forces from the border may be due their knowledge that their technology is deficient. In my presentation I discussed environmental policy from the view of the EU’s energy dependencies but I will return to that issue in another blog.